Husqvarna is partnering with Living Beyond Breast Cancer for its fourth annual Saws for a Cause program. Consumers in the U.S. can participate by purchasing limited-edition pink toy chainsaws from local dealers. For every purchase of a pink toy chainsaw, Husqvarna and its partners will donate $31 to Living Beyond Breast Cancer, a charitable organization that provides programs and services to those whose lives have been impacted by breast cancer. 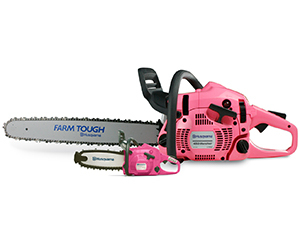 To raise further awareness for the cause, Husqvarna is holding the 2016 Husqvarna Breast Cancer Awareness Giveaway, where one randomly selected winner will receive a limited-edition pink 450 Rancher chainsaw and limited-edition pink toy chainsaw. No purchase is necessary to enter or win. The giveaway entry period runs from Oct. 1 to Nov. 15.